bebob and ARRI have cooperated in order to meet the increasing power consumption of modern cameras and lighting with a sustainable solution. In close consultation with ARRI, our engineers developed the B-Mount – a new battery mount system that fulfills the power demands of today’s equipment while providing maximum flexibility at the same time. ARRI will be using the B-Mount for all its future cameras. 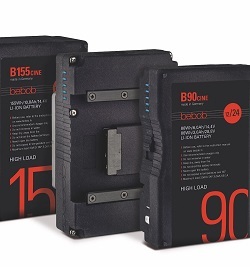 B-Mount batteries provide a dedicated mobile power supply for high-performance 24V devices. The new system is also equipped to support multi-voltage use (both 12 Volt and 24 Volt). This adaptability to the respective needs of compatible devices makes it possible to supply all devices on set with a single B-Mount battery system. The Spanish company VELVETLight, formerly known as THELIGHT, changed its name to VELVET because of the great international success of this line of luminaires. The 2×1 panel (60x30cms) entirely made of aluminum is designed to work on location and withstand harsh treatment and the most extreme conditions such as rain or shooting on dusty conditions. 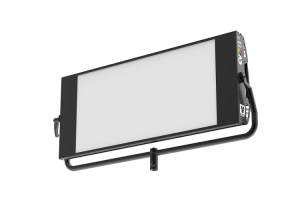 The EVO 5 LED full spectrum technology produces a very wide range of colors and a white light of great purity with CRI 97, wide gamut chromaticity and allows to adjust the color temperature between 2,500 K and 10,000 K.
EVO 2 Color is a lightweight portable panel with a weight of 7kg and produces 900 Lux at 3 meters with a consumption of just 200W so that it can be powered at full power with standard Vlock or Gold batteries. 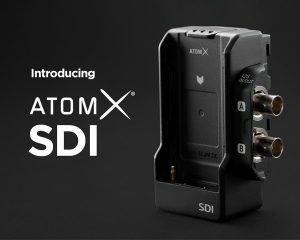 Introducing the Atomos AtomX SDI expansion module designed to turn your Atomos Ninja V into a pro video SDI powerhouse. The module adds the quality and convenience of SDI equipment and infrastructure connectivity in additionto its existing HDMI capability. Monitor and record SDI up to 4Kp60, and go into or out of any SDI device including the popular Atomos Shinobi SDI pro monitor and Atomos Shogun Inferno, as well as legacy Atomos SDI products. 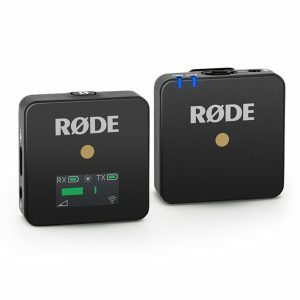 This provides flexibility for any video or film production to allow all crew including directors, cinematographers, assistants and focus pullers to monitor and replay identical and calibrated content in HDR at the same time. 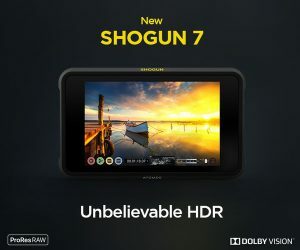 Introducing Atomos Shogun 7, a precision 7-inch HDR monitor-recorder-switcher designed for the film and video professional. It can be used as either a stand-alone field monitor, recorder and switcher for event, documentary and live in-the-field storytelling; or as a tool for large-scale on-set episodic TV, film and cinema productions where multiple crew members such as focus pullers, grips and cinematographers require a consistent visual reference across the field monitor ecosystem. Shogun 7’s portable size lets you monitor, analyze and tag while on set; and check how your content will look in your audience’s home via real-time Dolby Vision output. Switch live between 4 x ISO SDI asynchronous video streams on the fly – ideal for streaming and recording sports, theatre and live company-wide presentations. Capturing in 4K is now becoming a requirement for content streaming providers. With the latest HDMI 2.0v you can capture up to 4Kp60 on any available camera, or via Quad Link, Dual Link or Single Link. If slow motion capture is important to your production, Shogun 7 lets you capture 2K up to 240p – even in RAW. You can tag on-the-fly while recording for direct-to-edit look up in Final Cut Pro X, Adobe Premiere and Avid Media Composer.